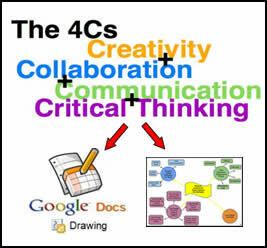 To help students develop skills necessary for living and working in the 21st century, educators must provide them with learning experiences to allow them to master the 4C’s: creativity, critical thinking, communication, and collaboration. Opportunities for students to work together to solve real-world problems foster the development of these skills and also require students think outside of the box to generate a number of different solutions to solving a problem. Brainstorming can be a key part of this creative process. The features available in the drawing component of Google Docs are well-suited for online, collaborative brainstorming sessions for quite a few reasons. Use shapes, arrows, text, word art and imported images to build a visual mind map for any task. Groups of students can collaborate and share ideas on the same mind map from locations near and far. Digital brainstorming sessions provide all students with an opportunity to contribute, unlike traditional brainstorming sessions which encourage contributions from the “quick thinkers” in the room. Contributors are assigned their own color and the revision history highlights and tracks changes to any Google Doc. It’s easy to see what each student has contributed to the big picture. Some generous and innovative users have created and shared templates for everyone to use. Use them as a starting point or a model to create your own templates for students. 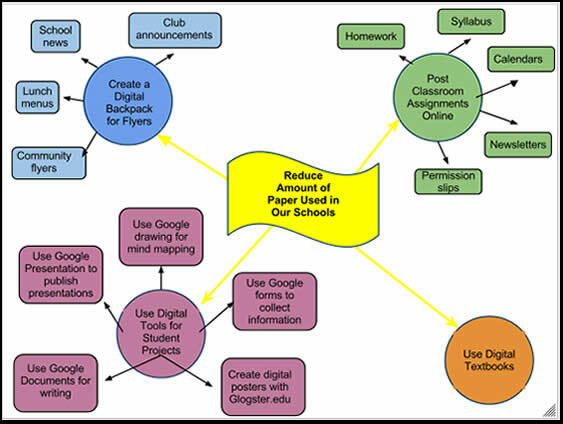 I believe Google drawing tools will provide en efficiency in brain storming activities because it includes the other student from other classrooms and schools. Todays' students are global student!